The Time Splitter wanted to join a different group. Former IWGP Junior Heavyweight Champion and NJPW star Kushida is finished with New Japan Pro Wrestling. Ringsidenews.com reported that recently in the Wrestling Observer Newsletter, it was speculated that one of the reasons why Kushida left NJPW was that he wanted to turn heel and join the Bullet Club. Kushida had been one of the best wrestlers in NJPW and was consistently in the title picture for the IWGP Junior Heavyweight Championship. Since NJPW felt he might be leaving the company in early 2019, Kushida lost the IWGP Junior Heavyweight title to Taiji Ishimori at Wrestle Kingdom 13 on January 4th. 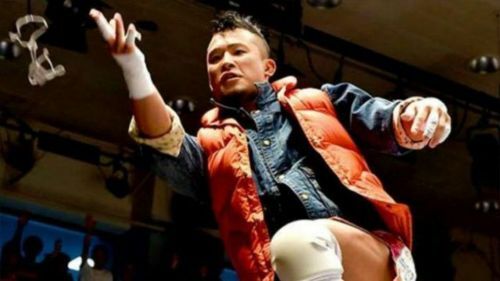 The Wrestling Observer Newsletter revealed that Kushida's departure from NJPW was mainly due to wanting a shift in character. Gedo is one of the top bookers in the company and is now a member of the Bullet Club alongside his new protege, Switchblade Jay White. Bullet Club OG member Tama Tonga apparently was sad to see Kushida go and was unaware that Kushida wanted to join up with his squad. Kushida probably lost the belt to the man who did take a junior heavyweight spot in the new version of the Bullet Club in Ishimori. Tonga's reaction should be noted since he's a founding member of the group an apparently didn't hear about Kushida's desires to join up with him. Kushida has done all he could do in the Junior Heavyweight division so wanting to turn heel is a logical move for his career. Having him join the Bullet Club would have helped them replenish their ranks. Since the schism of the group, it has been an uphill battle rebuilding one of wrestling's most influential groups of the last decade. Another interesting point brought up by Tama Tonga is that he had no idea that Kushida wanted to join the Bullet Club. It could speak to the discord between backstage bookers and the talent in the ring. One thing is for sure - Tonga was totally correct in stating that another good one was gone. It's NJPW's loss and WWE's gain. Exclusive: Guitar hero Marty Friedman on his history with sports & his new album "ONE BAD M.F. Live!!"